When does the stringent limitations of reality blur merging the injection of hyper adrenaline unleashing momentary extraordinary deeds. Their recollection from multiple perspectives attain extraordinary retelling as urban legends and potentially believable myths? M. Night Shyamalan ( Sixth Sense, Signs, Village) has crafted an effective creepshow with "Glass," a shotgun marriage of his 2000 horror hit "Unbreakable" and 2016's "Split," an even bigger horror thriller. not unexpectedly, the film has awkward moments as it ties elements from the originating productions. Shirtless "Die Hard" Bruce Willis chases a "beast" (somewhat Hulk-esque without the green skin) ) who is one of the collection of James McAvoy's multiple personalities. The film rests on the premise of erasing superhero encounters from the common citizen. Like Incredibles, X Men, and the latter Superman entries the world has a fear of subjects with "super" or paranormal gifts. 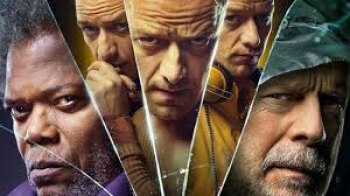 Unlike the three mentioned films, "Glass" focuses on individuals allegedly possessing strong obsessions that elevate them to dangerous vigilantes. An unsettling thought--- do superheros represent substitutes for concealment of so-called extraterrestrial encounters and paranormal activities? Despite muddle, M. Night Shyamalan's mystic overtones propels this dark twisted psychological horror film with a chaotic thread that pays homage to noir films by designing a Picasso painting on screen. The ending is divisive and risky, and that's no spoiler either.